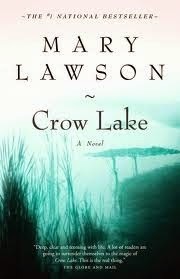 a book chick: "Crow Lake"
my take: There's something wonderfully haunting about this book. In the opening paragraph: "When the end came, it seemed to do so completely out of the blue, and it wasn't until long afterward that I was able to see that there was a chain of events leading up to it....The other thing we didn't know was that the Pye nightmare was destined to become entangled with the Morrison dream. Nobody could have predicted that." The four Morrison siblings live in Crow Lake, a remote, small farming community in Ontario. The dreams of their ancestors and the actions of their neighbors are the forces which determine much of their lives. The narrator is the third child and the story is told in bits and pieces as she remembers her childhood and contemplates attending a family gathering. There is a spare elegance in the writing style, an authenticity in the narrator's voice, and a deft craftsmanship to the revelation of the 'end.' I will be looking to read more of Ms. Lawson's work. my source: Cousin Ken highly recommended. Don't I have fabulous cousins? I see it was a Today Show book pick, as well. Haven't heard of this one... but sounds intriguing!